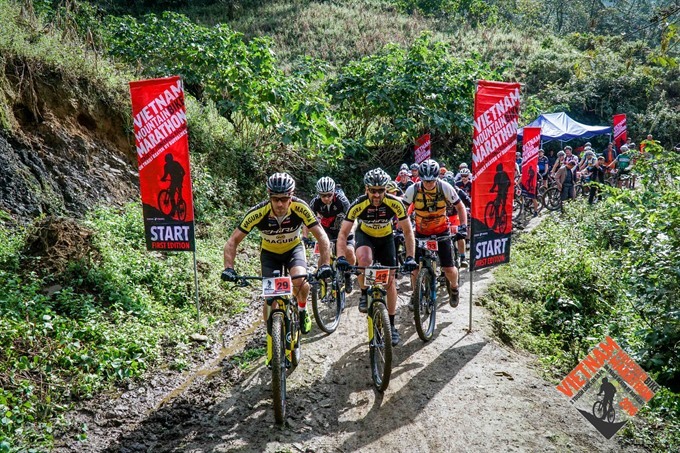 HÀ NỘI — Anthony Brown and Liesbeth Kanis won the first stage of the Việt Nam Mountain Bike Marathon 2017, which is underway in Sa Pa,Lào Cai Province. Brown from Australia finished the 48km race with 1,350m gain from Khoang Village in Sa Pa District’s Tả Giàng Phình Commune to Mường Hum of Bát Xát District, with a time of 2hr 29.18min. Kanis of the Netherlands took 3:45.19 to complete her tour. The second stage will be 68km with 1,800m gain from Topas Ecolodge to Thanh Phú Commune. The final stage is 27km with 750m gain from Khoang Village to Hầu Thào Commune. This is the second edition of this race, following some outstanding feedback from cyclists from the 2016 edition.